Bummer about ReadyMade. I hope that magazines last forever, but lately I just dont know if that will happen! Catalogs, however, seem to be here to stay. The other day I got four in the mail in one day. Does anyone know of a get-me-off-your-list phone number for catalogs? I have heard of Kirsty! I think its really pretty, but a little overwhelming. Did you hear about the Young House Love and Emily Henderson DIY challenge? I am inspired. Oh and I am SO impressed with this roman shade idea. Sounds awesome and can't wait to see the results. So I was working on the photos from our trip to Florida and looking through some other summertime photos when noticed that in almost every shot I am wearing one of two summertime accessories that I recently purchased but never told you about! I didn't want to spend a lot of cash on clothes this season, so other than two pairs of shoes I blogged about, my wardrobe is basically just recycled from last year. I did however buy the following two accessories and I must admit, they have both made some very basic/classic outfits feel much more "2011"! The necklace is Nicole Richie's line, House of Harlow (one of my faves), but I got it on Gilt for about $30.00. I love the geometic shapes and the combo of gold, black and torquoise (the torquoise part is actually leather which is a cool touch). Its huge and super long which I love. I've worn it with lots of other shorter necklaces, a white tank top and jean shorts on the weekend and with black dresses and gold sandals to work. The belt is from the GAP and I got it on mega sale for $11.99 (sorry, no longer available!). I've been loving all the neon everywhere and was dying for a belt. 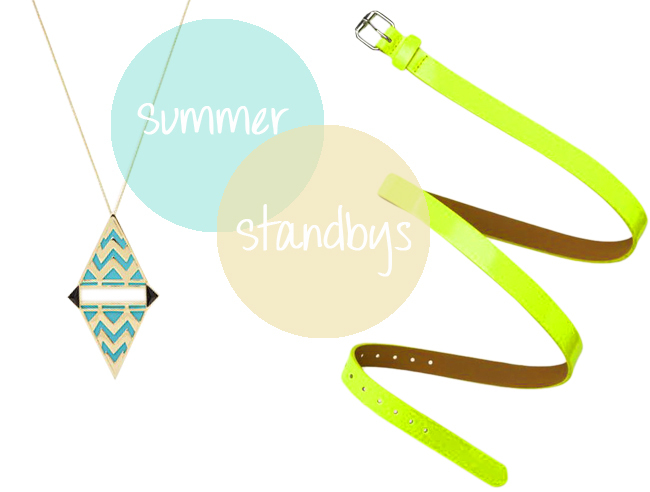 I especially am loving neon accessories with neutrals (exhibit A). So I went to about 10 different stores and no one had exactly the belt I was looking for... until GAP. Who knew? You could find one at Forever21 for $2.50 (mine was picked over) and American Apparel had some that were pretty close. Anyway, I've worn it with cream tops tucked into my white jeans and my wooden wedges to work on Fridays and over striped tunics with army green shorts and sandals on the weekends. Do you have any new summertime accessories I don't know about?